In loving memory of MARGARET THE BELOVED WIFE OF EDWIN WILSON OF THE SCHOOL DALLOWGILL. BORN JULY 2ND 1840. DIED SEPTEMBER 14TH 1890. ALSO JOHN THEIR SON BORN MAY 4TH 1882. DIED APRIL 23RD 1883. ALSO SARAH MARGARET (MAGGIE) THEIR DAUGHTER BORN JANUARY 18TH 1880. DIED DECEMBER 31ST 1888. ALSO FRANK THEIR SON BORN JULY 2ND 1867. DIED APRIL 29TH 1890. 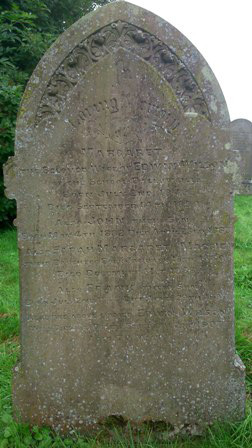 ALSO THE ABOVE NAMED EDWIN WILSON WHO DIED AT OTLEY FEBRUARY 2ND 1907 AGED 70 YEARS.